3 Men and a Baby?? Whatever!! Try 1 Lady,1 Review and 1 Recipe! This is how my mind works (Stick with me. It does go somewhere!) : I knew I wanted to review a particular restaurant. I checked my email first thing and saw that Adam Ant is coming to San Diego’s Balboa Theatre on July 17th. I started thinking about how I LOVED Adam Ant. I proclaimed to my mother while she was driving way back around 1982 that I will love Adam Ant forever. My sister, Beth, was a high school photographer and was lucky enough to go to his concert in Cleveland, Ohio, and she took photos of him backstage. Beth was already a god to me; this just solidified it. It must have been around 1983 when I had a gym routine requirement with Miss MacDonald. God, I did not like that lady. Sorry, but it is true. Miss McDonald, if you are reading this, you were probably a nice person, I just never got a chance to see that side. Well, I picked the song “Antmusic” by Adam Ant, of course! Like, totally! This was back when there were no Ipods, not even a CD! The horror! I asked my sister to borrow her record, Kings of the Wild Frontier. Beth knew that I, being the little sister, had a horrible track record when I borrowed her stuff. Any articles of clothing were bound to get at least one stain on it, so she was wise to tell me I couldn’t bring the record to school for my gymnastic routine. The problem was that I had choreographed (I use that word loosely) and practiced my routine to that song. I couldn’t change it. What could I do? I had to put a cassette recorder next to the record player and record the song. When I played the cassette tape at the St. Christopher gym, you couldn’t hear it at all. Huge failure. And my routine? Let’s just say I was not Olympic bound. Check out this classic 1980s video. Aahhh, good memories! Is he wearing lip gloss? Thinking about Adam Ant made me think about the 80s and all of the stuff I loved back then. For some reason the movie Three Men and a Baby (1987) came to mind. I started thinking about how if three grown men couldn’t take care of baby, that would be really sad. That led me to think that I shouldn’t just write a review today, I should include a recipe. If it took three men to take care of a baby for a month (or however long they had the kid), I could write a review and a recipe in one post. Yep, all of this from seeing an ad for Adam Ant’s concert. 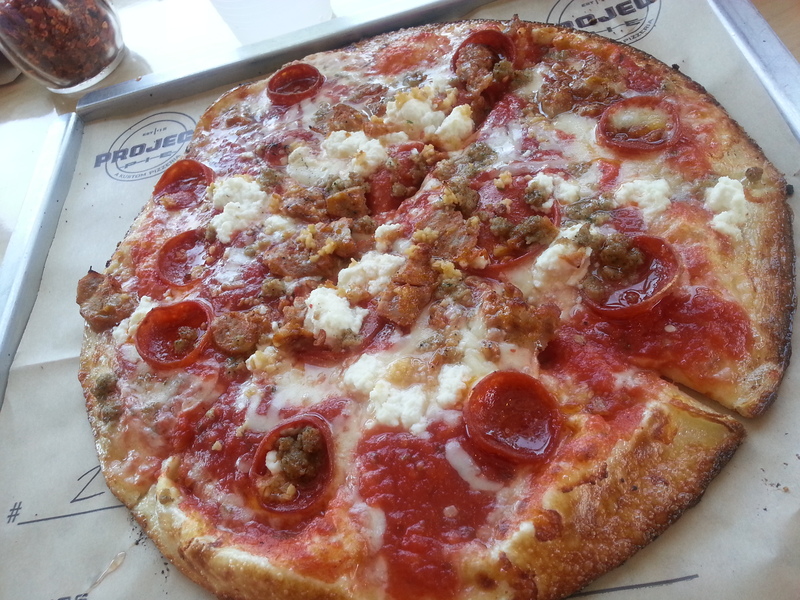 My husband and I checked out Project Pie in Hillcrest this past Sunday. Unfortunately, most of our families are in Cleveland, Ohio, so we were on our own for Mother’s Day. We walked in, and we immediately greeted by the pizza makers. 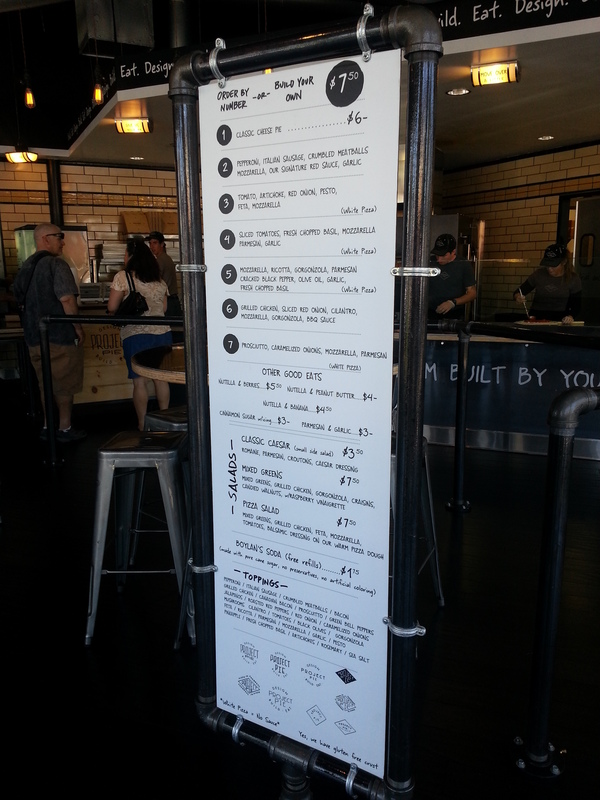 There is a list of pies and a description of each when you enter. It’s kind of cafeteria style. You pick a pie, tell the first person which number you want, move down a bit, tell the next person which additional, and free of charge, toppings you would like. They get your name and the pizza details, and the next person writes it on parchment, and the pie is placed into a big pizza oven. I ordered the #2: Pepperoni, Italian Sausage, Crumbled Meatballs, Mozzarella and their Signature Red Sauce. I added Ricotta and Artichoke Hearts, but I wasn’t paying attention and the guy didn’t hear me, so I didn’t get the artichokes I requested. Next time I will speak up and watch which topping are on it before it goes into the oven! Franz went with another option and got a ton of extra toppings. Both pizzas were great. What I love about this place is that everyone gets their own pie. No arguments because one person in the group always wants pineapple on the pizza. You know who you are! Also, they offer a gluten-free crust, and I heard from a friend that it was super tasty. 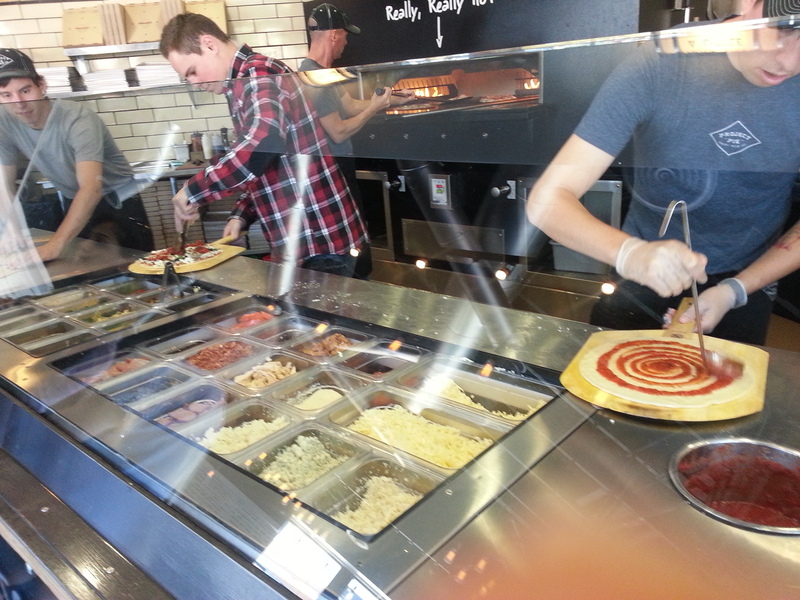 The red sauce was really fresh, and the toppings were flavorful. The crust was perfect as well. Great taste and I loved that it wasn’t too thin but not too thick either. My only tiny complaint was that the center of the pie could have been hotter. It was fine, but I like it a little on the well done side. Oh, I almost forgot, you can order a Nutella and Banana pie. Don’t think I haven’t stopped thinking about that bad boy since Sunday! Currently there are only 2 locations: San Diego and Las Vegas (at The MGM), but Project Pies will be opening soon in Atlanta, NYC, Boulder, D.C., and the Philippines. Pizza Pies are Being Made to Order! 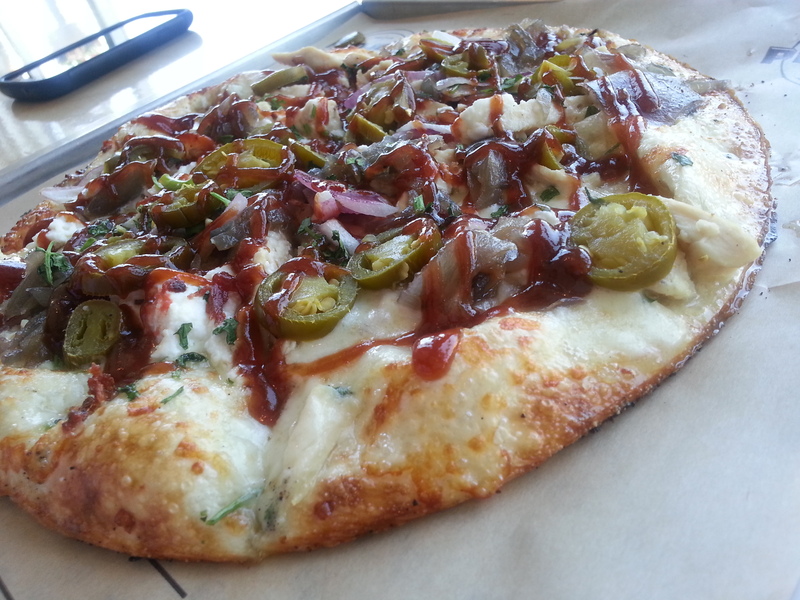 Franz’s Choice: #6 With A Bunch of Tasty and Free Toppings! My Creation – And I Requested Extra Sauce on Top. YUM! I promised a recipe, too! This is the kind of recipe that would work after a pizza dinner because it is sweet and light in texture. The recipe, Angel’s Kiss Baci Cupcakes, from Baci was created by Lidia Bastianich. Who doesn’t love Baci?? If you never had one, finish reading this post, and immediately get your booty to a grocery store and buy some. They seem to be carried everywhere nowadays. Thank god! With the first batch, the batter never got stiff and glossy. I baked them anyway, and they turned out perfect. With the second batch, the batter was as it should have been – stiff and glossy. However, the cupcakes baked horribly. The tops were uneven and shrunken. The next time I make these, I will stop before the batter gets stiff and glossy. Preheat oven to 375. Line 12 muffin cups with paper liners. In an electric mixer fitted with a whisk attachment, beat the egg whites and cream of tartar to form soft peaks. With the mixer at medium speed, gradually add the sugar. Beat at high-speed to stiff, glossy peaks. (**As I noted above, when I achieved the stiff, glossy peaks, the cupcakes did not seem to turn out for me. You can try either way, but I will stick with keeping the batter at the soft peak stage. Let me know if you make this recipe, or have made this in the past, and tell me what you did and how it turned out. Thanks!!) Lower the speed and mix in the vanilla. Fold in the flour mixture in 3 additions, taking care to deflate the batter as little as possible. Quickly fold in the chopped Baci. Divide the batter among the cupcake pan and smooth the tops. While the cupcakes cool, prepare the glaze. Put the chopped chocolate in to a small bowl. Bring the cream to a simmer and pour over chocolate, shaking the bowl to submerge the chocolate. Let sit 5 minutes, then whisk until smooth. Stir in hazelnut liqueur, if using. So take that Tom Selleck, Steve Guttenberg, and Ted Danson! Try doing that! Take Tubular Care, Totally Happy Eating, and Don’t Gag Me With A Spoon! That sounds like a good name for a pizza place! Peecha Pie! I love it! Pencil this place into our calendar for our Summer visit! Yum! Loved the walk down memory lane, too….we really needed better technology in the 80’s, but, I guess, it is even more endearing because we have these stories to tell. Love your blog, love you…you are my food goddess! We can truly appreciate the updated technology! However, I still find reasons to complain about it! haha And this place is on the list when you guys come to town! Thanks for your comment!! This might be my favorite post of yours yet! LOVE the story, review and recipe – it’s a trifecta of awesomeness!